But why is that, I ask myself. I’d suspect the same goes for most tourists who have visited the temple. 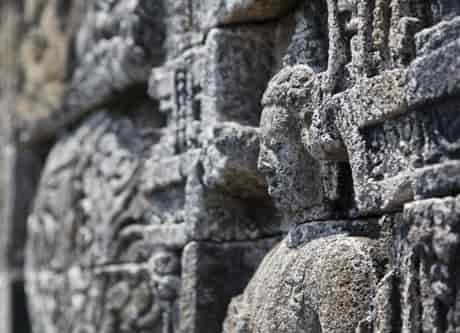 Borobudur, the largest Buddhist shrine in the world, dating back to the 9th century, justly draws visitors and Buddhist pilgrims from all over the world. 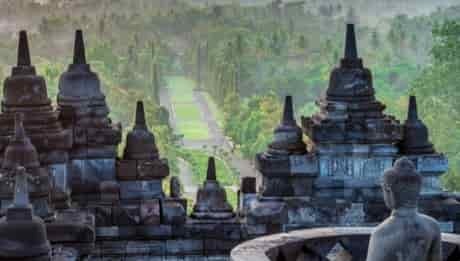 Understandably Borobudur somewhat overshadows the less grandiose attractions in the valley she calls home. Mt Merapi and Mt Merbabu watch over from the northeast, Mt Sumbing and Mt Sundoro from the northwest, and the Menoreh hills from the south. 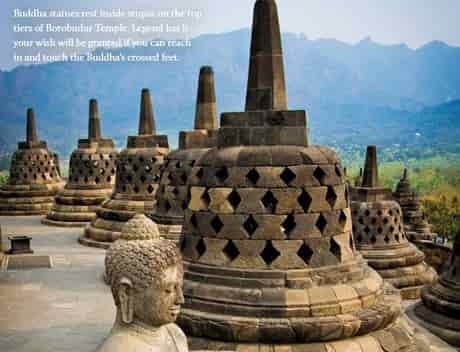 The Borobudur valley is rich in Javanese culture and tradition, where the Majapahit era’s Hindu-Buddhist religion still lives and breathes. These foothills are steeped in mysticism, and when you know where to look, you’ll ﬁnd treasures abound. Agus drives us through village roads strewn with paper cuttings from the recent Eid al-Fitr celebrations. I watch the smiley Javanese people going about their daily lives: most of them live oﬀ the land, while others have changed direction to support the steady stream of tourists and have built enchanting homestays to accommodate budget-savvy travellers. We take a right turn at a small intersection, which brings us past padi ﬁelds, ripe and ready for harvest, and Agus stops to let a row of adorable brown ducks cross the road. “Look to the left,” Agus says. I do, and in the distance, surrounded by rice ﬁelds and greenery as far as the eye can see, sits Borobudur in all her glory, her stone stupas basking in the morning sunlight. I’d seen the temple so many times from up close, but the vision of her resting from a distance is a new level in awe-inspiring. I can imagine this landscape hasn’t changed much since the Majapahit kingdom she was born in. A horse-drawn cart (andong) jingles past us as I stand on the edge of the road taking photos of the temple, and it truly feels as though we have travelled back in time. We jump back in the car. Agus tells me I’m in for a real treat at the next spot. He takes us down some even smaller village roads, and I start to hear the sound of rushing water. Next on my Borobudur valley treasure hunt is a quirky yet charming art house on the edge of where two rivers, Elo and Progo, meet. Legend has it that Elo river is female and Progo river is male, and their union symbolises the everlasting bond between a man and a woman in matrimony. The Elprogo art house is owned by an eccentric, dreadlocked painter, who goes by the musical name of Sony. Although his sanctuary is rustic, there’s a kind of magic that lives here. Stepping out of the car, I’m greeted by a cool breeze in the shade of one of Pak Sony’s Bodhi trees – the same type of tree that Siddhartha Gautama meditated under and attained enlightenment, becoming the Buddha. Even if you’re not keen on learning how to paint, this place is great for a visit and a cup of local coﬀee perched atop one of the benches on the ravine’s edge, overlooking the white water in the river below. After a coﬀee and a chat, Pak Sony leads me past his fairytale-like cottages towards his gallery. This rustic space is like no other I’ve been to, and I spend some time admiring his lifelike Borobudur relief paintings that adorn the exposed brick walls. The paintings appear to be threedimensional. It’s no wonder people travel from far and wide to learn how to paint from this talented artist. Light streams in at the other end of the gallery, and as I exit, a beautiful green-grassed garden appears before me. A peaceful retreat on the edge of the river, it’s here that I rest my weary legs and enjoy a picnic underneath the trees, looking on to where the two lovers Elo and Progo met and were bound together forever. I wake to the sound of a gentle breeze and leaves rustling in the wind. Agus walks over and reminds me that we have one more spot to visit. “Mendut Temple?” I say. I’ve already been there several times before. “Ah, but have you been into the Buddhist monastery behind it?” he asks me with a knowing smile. I’m not sure how I overlooked it in the past, but sitting right behind the 9th-century Mendut Temple is a beautiful monastery open to the public, home to monks from all over the world, who come to study in what is considered one of the most prestigious monasteries of this faith. Stepping through its gates, a feeling of calm sets in. This monastery is pristinely maintained and houses two meditation rooms, a large hall where – during our visit – monks are gathering for a seminar, and statues and relics of the Buddha in his many depicted forms. 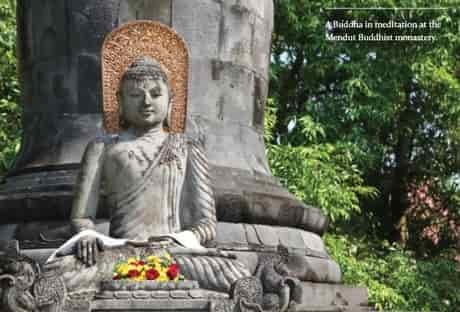 One particular statue, sitting underneath the shade of a Bodhi tree, catches my eye. It’s the Buddha, but not like any others I’d seen before. He is sitting in meditation, his stomach sunken in, his ribs and cheekbones protruding. We ask a passing monk what it means, and he tells us this is a depiction of Siddhartha Gautama at the end of his 49-day meditation without food or water, as he reaches enlightenment. Feeling motivated by this beautiful vihara, I spend an hour honoring it in silent meditation. The late afternoon sun shines on my face as I exit the prayer room, and I decide to end my day with a visit to Mendut Temple next door. I pay the small fee of Rp3,500 (US$0.40) to enter and settle myself under the giant banyan tree that towers over this understated temple. As I sit there I remember the slight smile on the statue of the skinny Buddha resting in the monastery, and this image is the perfect way to end our day in this spiritual valley. I’m left knowing that no matter how many times I visit this place again in the future, it will never cease to surprise me.